Finally, some brilliant guerrilla marketing for a panel manufacturer… from Nivea? I know times are tough for solar PV manufacturers, but if you want consumers to actually ask for your panel by name, you ought to copy this guerrilla marketing move by …Nivea. The answer: Manufacture a 8 ½’’ x 11’’ thin-film solar panel with a cellphone charger junction box, then hand it out inside a popular magazine to potential customers at the beach. 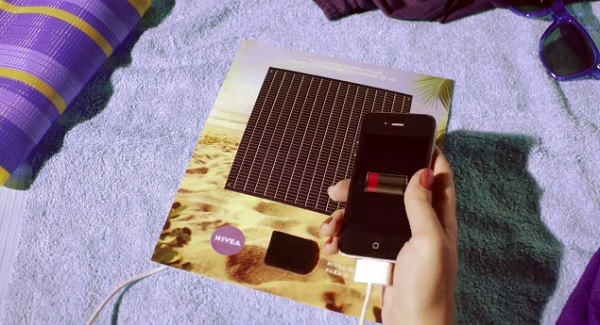 The underlying message: With Nivea sunscreen and a solar cellphone charger, you can stay at the beach until the sun goes down! So, no worries about sunburn, playing your music, text messaging, or watching videos while you play in the sun. You’re saying, “But that’s expensive, Solar Fred.” Is it? That’s a pretty small thin film sheet. Plus, this was all videotaped, so my guess is the campaign only printed 50 to 100 of these special magazines with the Nivea solar panel inside, and they they filmed people’s (actors’) reactions. So, not that expensive. And whatever it cost, 100,000 YouTube views later and counting, Nivea is getting worldwide brand attention for their marketing investment. It really is a great idea, and it should have been executed by a solar PV company that wants to get brand recognition for all of those residential customers that continue to grow the solar market. Now, I know that solar installers and leasing companies are the ones who choose the panel’s brand. But a) many solar PV manufacturers are also getting into the leasing biz (good move), and b) who says that solar PV manufacturers can’t capture leads for their brand loyal installers? And c) Wouldn’t you like to replace Solyndra as the best known solar panel brand? Gees, I sure hope so. This is one way to start. We need more campaigns like this, solar panel manufacturers. The more we see solar panels in every day situations, the closer it gets to being mainstream (and profitable again.) UnThink Solar. Want more solar marketing info? Sign up for the Solar Fred Marketing Newsletter, or download the new Solar Fred’s Guide to Solar Guerilla Marketing.